Have you wondered what celebrating Christmas at sea is like? 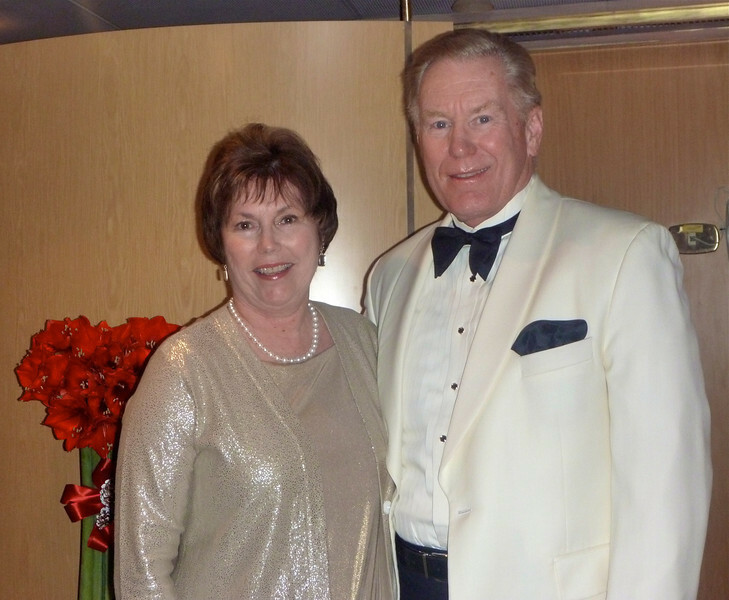 One reason that Alan and I booked a boomer holiday on Silversea’s Silver Cloud was to find out. Would there be enough Christmas on Silver cloud to satisfy us or would we miss the hustle and bustle (and the stress) of a holiday at home? When we first arrived on Silver Cloud, I had my doubts. While there were Christmas trees scattered about, the entire holiday mood was an understated one. And some of the decorations, especially in the Panorama Lounge, looked as if they needed updating. 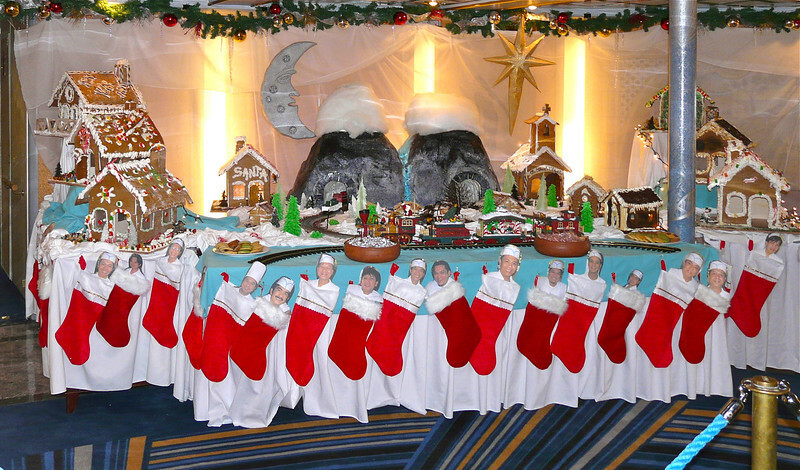 Cruise directors walk a fine line when it comes to celebrating Christmas on a ship. He or she needs to provide enough holiday finery and cheer to satisfy those who celebrate the holiday while not letting the events overwhelm those who don’t. International guests — with their unique holiday traditions — made up a sizable portion of the guest list on our cruise. And a number of cruisers were celebrating Hanukkah instead of Christmas. A day or two before Christmas Eve, gingerbread houses appeared in every lounge and restaurant, always accompanied by a plate of Christmas cookies for guests to sample. Door decorations were available for those cruisers who wanted to enter the decorate your suite door contest. On Christmas Eve, Silver Cloud’s pianist, Mario, played Christmas music in the Panorama Lounge as we toasted the night with a glass of champagne. After a dinner of Christmas goose (none for me, thank you), vocalist Tara Khaler performed in the Venetian Lounge. Later, Father Mark celebrated Midnight Mass for all who wanted to attend. Since it was also Hanukkah, a cantor was on board to help Jewish guests celebrate their holiday. Back in our suite, we discovered a plate of Christmas cookies, just in case we were still hungry. 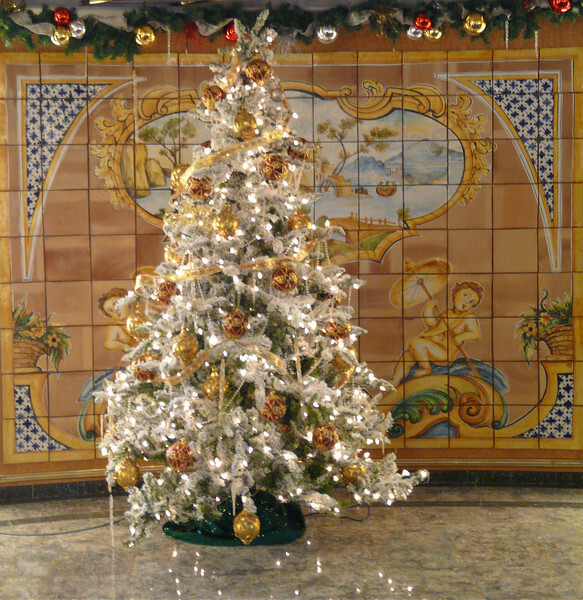 As Alan and I walked around the ship on Christmas morning, the staff (and other cruise guests) greeted us with smiles and “Merry Christmas.” At lunch, a jazz trio played holiday music in the main restaurant while guests enjoyed the chef’s elaborate galley lunch. Later, Santa presented gifts to the two children on board. Our Christmas day ended with a formal dinner dance. But first, the entertainment staff performed in a pre-dinner show that included Christmas favorites. 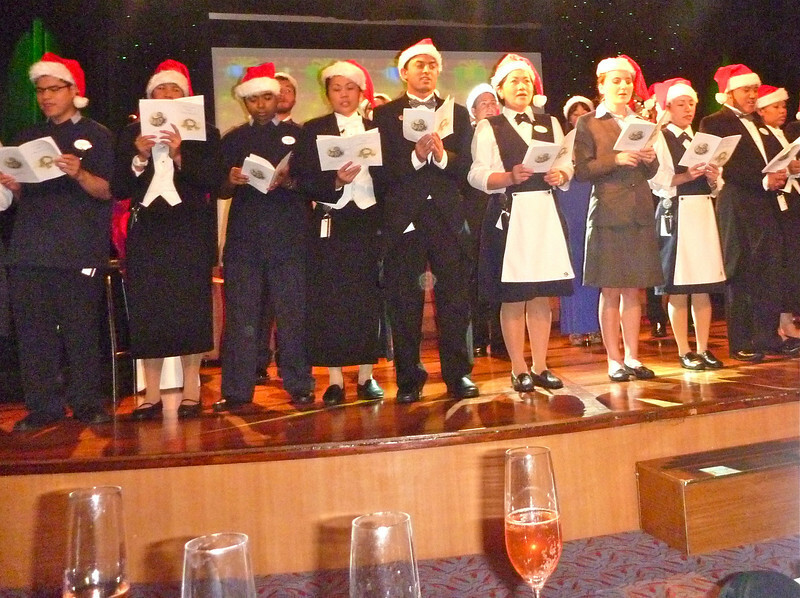 The highlight for me was when the housekeeping staff marched on stage wearing Christmas hats. We joined them in singing carols like Silent Night, White Christmas and We Wish You a Merry Christmas. A six-course turkey dinner followed in The Restaurant. Acoustic guitar performed by George Sakellariou provided a soothing end to our holiday. But one more Christmas gift waited in our suite – Panettone – a delicious, Italian culinary tradition. So there you have it – Christmas on Silver Cloud. Have you celebrated Christmas at sea? Come join the conversation at the My Itchy Travel Feet page on Facebook. Or send us an email with your thoughts.